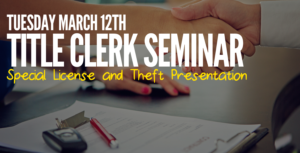 Join us for this year’s Title Clerk Seminar at the Sheraton Imperial Hotel at Research Triangle Park! Conducted by DMV Training Staff, this seminar will cover both basic and advanced titling procedures. If you have never attended this beneficial seminar, don’t miss your chance!